Pretty obvious question but just wanted to check. On the attached image I have annotated an example of trading a resistance break on Sainsburys. I would normally identify the resistance then put my entry above this with some clearance for fakeouts, in this case it was 0.75 of a point of clearance. As you can see the trade opened before it got to the line, I assume this is because it has reached the buy price, due to the spread. See circle in top right corner. If so am I right that on spreadbetting I just need to allow for my clearance plus spread, therefor put my entry a bit further from the resistance point? Hi @RichB-Trader, yes you need to add the spread, not sure which platform that is but you should be able to flick through settings and price to toggle back and forward between ask and bid and see by how much price jumps on the chart. Hi, thanks. The system is IG's trading App. I had a look at the Ask and Bid prices, so thanks for that. When I click them all the bars move up and down as you would expect. So I guess I need to look at my Mid market price on the chart and add or subtract (depending if I am going Long or Short) away the difference to the Buy/Sell Price. 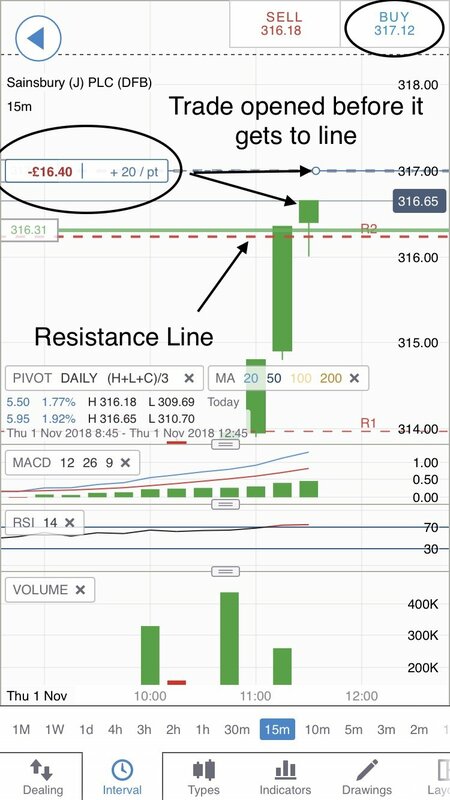 For example if I wanted to go long at 1000 points (this being the resistance level found when drawing on the mid price chart). If I was putting in an order to be filled later and I knew the spread from Mid to buy was say 10 points, I should go in at 1000 +10 points minimum. The opposite is true for going short once through support. Indeed @RichB-Trader, most people stick to the mid price and give it a bit of lee way. If you look at a price ladder you would see a cluster of orders about a resistance level with orders at every point a bit like a standard deviation bell curve laying on it's side so creating a resistance zone rather than a defined singular level. Thanks, that makes sense. What is a price ladder or is that just a metaphor? I seem to be sometimes just triggering the order then it retraces the counter way, however sometimes I set it higher and miss out on profits. I guess this is the art of technical analysis. Hi @RichB-Trader, yes it does do that doesn't it ? and yes there is an art to it. A price ladder is just another type of trading platform that shows resting orders above and below price, IG has one on the DMA platform. See pic below, the sandy coloured bars on their side are total traded volume for each price level (I've drawn a red curve round them). The largest vol bars would have been at a significant level but orders were building up leading into it and building down leading out of it so more of a zone than a level. Thanks so much for that, really helps. Are the bid and the ask prices what’s in the market, I.e the lowest price someone will sell and the highest price someone will pay. Or is the mid market the actual last price paid on the market and the bid and ask is the spread where IG make the markup. @RichB-Trader, yeah, the bid price is the 'best' bid price available as in someone has an order there to buy from anyone willing to sell at that price, and the ask is the best available price someone is willing to sell at. The mid price doesn't exist as such but is just a half way reference point between the two. As best bid and ask orders are consumed the mid moves up or down to sit between the new next best bid and next best ask prices available. Does this mean that at some point yesterday there was a sell price of 145.85, at that same moment there was a buy price of 146.23. Meaning somebody actually sold at the lower 145.85? But after that the bid prices went up. So therefore let’s say the resistance I found looking at the mid market price was exactly 146.04, for arguments sake it is not a zone as you showed. Does that mean I should actually look at the bid price and short just beyond there as that is the lowest price somebody paid. Reason being I haven’t been doing that, so when I trade support and resistance breakouts just beyond the highest or lowest price I end up opening the trade then it at times reversed just at my entry point. Having back tested there seems to be a few examples where if I had used the Bid or Ask price rather than mid market it would never have opened and therefor not made my losses. Hi @RichB-Trader, the market is not as ridged as that unfortunately, the market is an auction, if you have ever seen a car auction the bidding can get very frantic at times and single prices can get knocked out very quickly. The trading markets are two way auctions so there is buying and selling at the same time with traders constantly trying to get in or out so price oscillates in the small time frames such as seconds while also moving in waves in the larger time frames. Trying to pick the exact breaking point with a tight stop is a very tough game. Take a look at this video for some ideas on different ways to play breakouts. Thanks I will have a good look at that video. Am I correct in my logic that in my example some point yesterday there was a sell price of 145.85, at that same moment there was a buy price of 146.23. Meaning somebody actually sold at the lower 145.85? But after that the bid prices went up. ﻿Understanding it would be by the second bidding but the lowest price sold was the bid price at 145.85? In the example, someone was willing to sell to you at the ask price 146.32 while at the same time someone was willing to buy from you at the bid price 145.85 (you having borrowed the shares off IG). So to get into a trade you either sell the bid to short or buy the ask to go long. To get out of a trade you do the opposite. @RichB-Trader, Hi Rich, not necessarily, there may have been a gap leading up to the current prices or may have climbed smoothly through the levels or may have been oscillating back and forth in the same region for some time. On high volatility and looking at small time frame candles you will often see the candle pulse up and down before closing, to demonstrate what is actually happening I've included a video of a price ladder in action. I'm not suggesting you need to learn how to use the ladder but just to watch it for a short while. Current price is in the middle and next to that on either side are the orders being consumed and reloaded at split second speed causing price to jump up and down about the same few points before one side is overwhelmed moving price on to a new level. The ladder part starts about 3 min in, price is in the center grey column, buy orders on the left in blue and sell orders on the right side in red. This is in a major index and a single stock won't usually be as volatile as this but it shows the battle between buyers and sellers over just a few points.